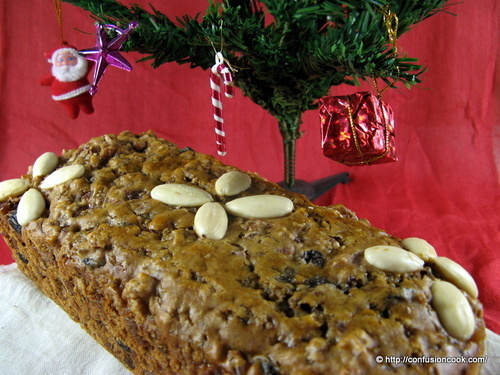 I have a love & hate relationship with a Christmas Fruit Cake/ Rum Cake/ Plum Cake. Honestly speaking I do not know if they are same or different. I’m not THAT much pro who can discern subtle differences & google didn’t help AND one of the 3 is available in abundance in most shops during festive season. Well the point is I sometimes like it a lot or sometimes I do not. 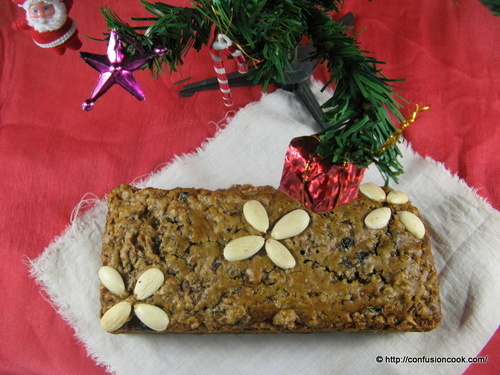 Last year due to pregnancy I did a quick version of Eggless Fruit Cake. But this time round, I wanted to really take my time and do it with lot of fan-fare. ;) Most recipes online for an eggless version take you to boiled fruits recipe using caramelized sugar or jaggery. That’s not me. After hours of search I came across a Vegan Cake on Suma, which does not boil fruits. 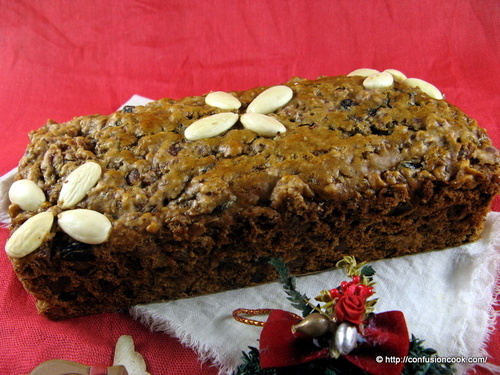 It can be made with soaking fruits overnight or earlier, have 2 baking cycles like a true Christmas cake and it feeds the cake with brandy. Voila! You can’t imagine how thrilled I was on finally getting the perfect version of cake I wanted. I quickly de-veganized (for lack of proper word) the recipe i.e made it into a simple eggless recipe and not the vegan version, I skipped lemon zest as I do not have a microplane. I added walnuts & almonds (you can also use other nuts like hazelnuts, pecan, etc.). I halved the recipe and my biggest challenge was to adjust the baking time & temperature according to the new baking pan. Let me mention here that in blogosphere, I’ve come across very few bloggers who genuinely encourage a novice like me to bake/ cook. Most food bloggers ignore your queries on account of being busy. Since this was my first attempt I really wanted to confirm the adjustment in baking time & temp with some seasoned baker. Believe me when I say that I knocked on plenty of doors & no one responded (one even removed my query from the comment section, I was quite bewildered as it wasn’t spam & I didn’t know why she would do that). Except one – Jules from Butcher, Baker, she responded promptly and since she teaches baking and decorating, I was quite relieved to have her answer. Thank you Jules. It is best to make this cake well in advance by 3-4 weeks so it can be brushed with alcohol allowing the flavors to mingle and age. You can feed the cake, over time with alcohol (usually brandy, sometimes rum or fruit juice of your choice). I made this cake 3 weeks in advance & brushed it 1-2 times weekly with brandy. Also, you need to add another 3-4 weeks for soaking the fruits. I didn’t start that early and managed to soak for about 10 days. For best results, start 6-8 weeks before Christmas. I didn’t want to frost the cake (read: reduce calories) so I used blanched almonds to decorate. My kitchen filled with the aroma of heavenly smelling cake. As usual I baked it when both hubby & kiddo were out. I even fed the cake on the sly as I didn’t want to see V making long face & coming up with numerous arguments on why the cake can be cut or eaten now rather than till Xmas Day. He also thought that I’ve lost it wasting precious mls of his brandy. While feeding the cake, one needs to ensure that it is not over-saturated or it will turn soggy. So before each feed, check if the cake is dry enough to receive more liqueur. The cake tasted moist & laden with brandy. Since I knew my son wouldn’t eat a fruit-filled cake, I used brandy. If you wish to give to kids, you can use fruit juice in place of brandy. It is one of the best cake I made or eaten this year. 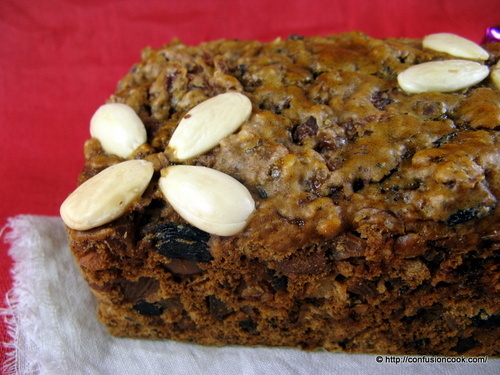 Soak the chopped dried fruits (currants, sultanas, raisins, glace cherries, mixed peel, tutti-fruity, dates) in brandy/ rum/ fruit juice atleast 10 day prior to the cake making. For soaking, place the dried fruits in large air tight bowl & cover with your choice of alcohol or juice. Mix well. Seal the container in cool, dark & dry place. Allow the dried fruits to soak & develop flavor for as long as you can. Occasionally give the whole bowl a gentle shake to allow further mixing. This step can be carried out days/ weeks/ even 1-2 months in advance. I did it 10 days before the baking. Pre-heat oven to 160 C. Lightly grease a 8 X 4.5 X 2.5 inch loaf pan. Line the bottom of the tin with 2 layers butter paper. Also line the sides of the pan with butter paper that extends 2″ above the top edge. (You can hold the strip with a paper clip while filling/ baking). Drain the dried fruits. Reserve the alcohol, if any. You can add the same in the batter or use it to feed the cake after baking. Lightly coat the drained fruit with little flour to avoid sinking to the bottom of the pan. Sift flour, salt, cinnamon, nutmeg & all spice into a large bowl. Rub in butter using your fingertips. Stir in the sugar, soaked fruits, nuts & ground almonds using wooden spoon. Give it a good stir. Add all but 2 Tbsps of milk & stir gently. Warm the remaining milk in microwave (it should not be boiling but warm to touch). Pour the warm milk on the baking soda and then stir it thoroughly into the mixture. Do not beat. Pour into the prepared pan, slightly hollow out the center so that the cake doesn’t form a dome upon rising. Decorate the top with blanched almonds. Bake at 160 C for 45 mins without opening the door. Then reduce the temp to 150 C & bake for another 30 mins or till a skewer inserted near the center comes out clean with just few moist bits. Cool completely in the pan on a wire rack. De-mold & remove the butter paper. Marinate a cheesecloth in brandy, allow it to soak well. Gently squeeze the cloth to remove excess brandy, the cloth should be moist enough. The cheesecloth should be able to go round the cake 2-3 times. Using a skewer or tooth pick, poke holes on the underside of the cake. Brush with drained brandy (step 3). Cover the cake completely in cheesecloth going round 2-3 times. Then wrap tightly in aluminum foil and place in an air-tight container. The foil should not come in contact with the cake directly. Do not refrigerate this cake while feeding. After 4-5 days, remove the foil & lightly brush the cake with more brandy through the cheesecloth. Through the old foil & wrap in new foil. Repeat the process till you are ready to eat. This cake keeps well for several weeks.